The BSC team has been supplying affordable, durable storage solutions to companies in various sectors for over 40 years. Our heavy-duty steel storage lockers are the ideal solution for various industries and sectors. We regularly serve law enforcement personnel, military officials, emergency first responders, and others with the most up-to-date and secure storage solutions available today. We can build lockers to meet or exceed expectations and organizational needs in pretty much any industry and for most purposes. And we’ll design them to your specs, right down to your décor and color scheme. Our storage lockers can be designed in varying heights and styles and offer the ideal secure space for any personnel to store their personal belongings, specialty gear, and more. Through adjustable shelves, hooks, cabinets, rods, and compartments, we can create easily accessible spaces for those people in industries that require uniforms and specialized equipment. With people carrying around expensive personal devices like laptops on a regular basis, as well as valuables like wallets and purses, you can’t afford to risk theft in the workplace, or you could be held liable. Our lockers are also ventilated to ensure freshness even in a high-use environment like gyms. And they are adjustable should your needs change over time. Our strategically ventilated lockers may also be outfitted with various storage features such as slide-out trays and adjustable shelving. We can even design lockers on spec for specific types of equipment – for instance; our CPU lockers are designed for secure storage and smooth accessibility of computer hardware. We’ll ensure you can fit all of your heavy-duty items as well as personal belongings. If you’re in law enforcement and you’re looking for innovative ways to track evidence as it’s passed between different departments and keep it secure in the meantime, we can help. Our evidence management solutions are created with compliance as a priority. We understand that you have a legal obligation to handle special materials and evidence with the utmost care. That’s why we have options for you to track, audit, and protect evidence at all phases of a case. Whether we’re talking about biological materials, weapons or other sensitive materials, we can design lockers with temperature control in mind. We also have barcode and RFID technology to help you track everything as it’s passed from hand to hand, so you don’t have to worry about tampering. We can configure evidence lockers in any setup you prefer, including mobile systems, dry storage, racking and pass-through lockers. We also offer extremely durable wire mesh lockers for larger items. Law enforcement professionals require high standards when it comes to weapons storage, and especially for emergency calls, there’s no extra time spent struggling to access or load weaponry. That’s why we recommend TA-50 storage locker solutions for law enforcement teams, military and other organizations which require the most secure and durable storage solutions possible. Our TA-50 lockers are made from the highest quality steel and are specifically designed to handle tough and heavy equipment such as handguns, and shotguns. We offer all builds with multiple inner compartments and bi-parting doors. 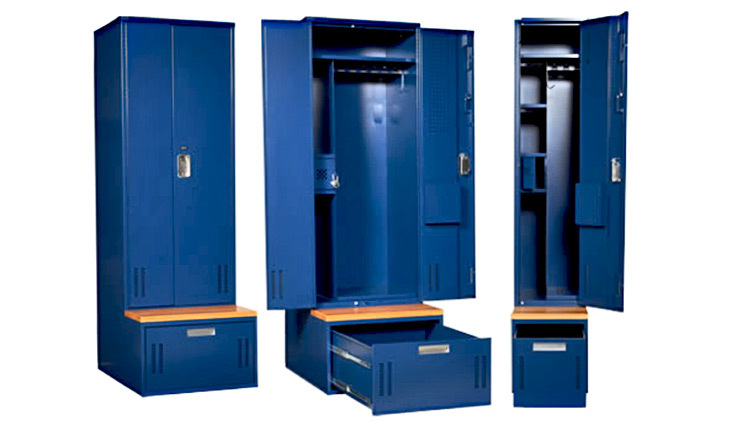 Lockers can be built freestanding or installed in rows, either vertically or horizontally, designed to fit any space. 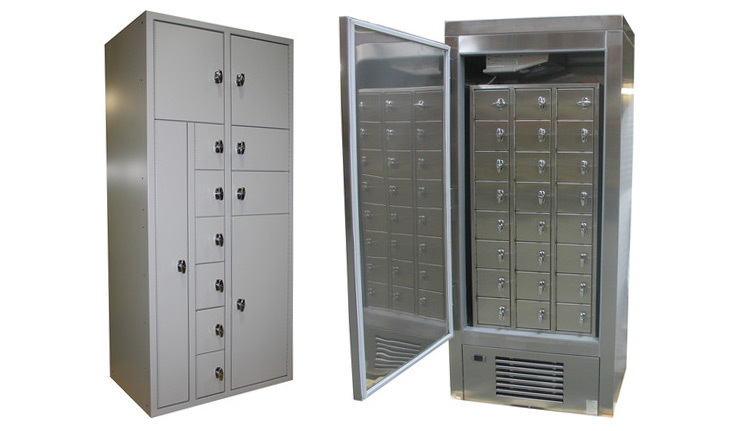 The highly durable lockers can accommodate various specialty accessories, may be built with one or more meshed doors and come in a variety of dimensions and finishes. We recommend the TA-50 solution for all of your small arms and heavy-duty equipment storage because they are highly secure yet versatile, allowing easy access to almost any type of equipment. We’ll ensure the lockers are fitted to your exact specifications and in such a way that your gear is safe and ready to grab at a moment’s notice. If you’re looking to design your space for maximum efficiency and workflow optimization, our design experts can help. We know that your bottom line depends on getting the details right, and that’s why we’ll work closely to make sure all your needs are covered. We source only the highest quality materials and are sure to comply with relevant safety codes in your industry and region. Our installs are quick, quiet and painless, and we’ll take care of every aspect of the job from beginning to end so that you can focus on what matters most: your business. Our expert team works with you at all stages from a re-evaluation of your business systems to training colleagues and staff after the implementation of new solutions. Our solutions are always custom-made to fit with your standards, safety guidelines, aesthetics, accessibility requirements, and space setup. At Business Systems and Consultants, we’re always looking for a leading edge when it comes to storage solutions. We offer maximum durability and optimized design to help you become more efficient and boost your bottom line. We are dedicated to innovation, safety, and quality in industrial storage, material handling, and modular office solutions. Want to learn more about how our experts can help you find the best solutions for your needs? Contact us today for more information!